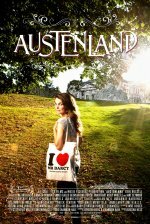 Austenland release date was Friday, August 16, 2013. This was a Limited in theaters release. Follows 30-something, single Jane Hayes (Keri Russell), a seemingly normal young woman with a secret: her obsession with all things Jane Austen. But when she decides to spend her life savings on a trip to an English resort catering to Austen–crazed women, Jane's fantasies of meeting the perfect Regency–era gentleman suddenly become more real than she ever could have imagined. Based on the novel by Shannon Hale (who also co-wrote the script).